As you escape the chaos that is the George St light rail construction zone you can’t help but be taken aback from the sheer size and grandeur of the Hilton Hotel and more specifically, their restaurant, glass. Arriving a little early for our reservation, we decided to sit at the bar and kick off the evening with a cocktail each. I often tend to lean more to fruity and fresh cocktails and the Pineapple Express did not disappoint. An infusion of Archie Rose gin, lillet blanc, pineapple puree, passionfruit, lime juice, prosecco served in a tall glass and topped off with ice, helped me hold on to the thought of warm weather just that little bit longer. My dining companion, Raf, on the other hand opted for something a little more bold and ordered Conrad’s Dream, a Woodford Reserve bourbon, creme de cacao, Drumbule, Peychaud and orange bitters served in a martini glass. 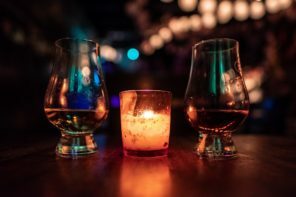 Upon taking a sip, it was a stark difference to my fruity and fresh beverage, the bourbon was incredibly smooth and silky and felt like you were being hugged from the inside out. When our table was ready, we were lucky enough to sit by the window, and I often caught myself marvelling at the architectural beauty that is the QVB, a nice touch to the overall dining experience. After reading and rereading the menu several times. tossing up between the amazing variety of dishes, we placed our order and advised the waiter that we’d like to match a wine with each course. Within moments head sommelier, Mauro Bortolato, appeared and wowed us with his immense knowledge of the extensive wine list and why each matched with our chosen plates. For entree we decided on the crab omelette which appeared almost crepe like.Topped with okonomiyaki, bonito, nori, Japanese mayonnaise and when placed on the table, our waitress poured a broth on top which tied the flavours of the dish all together. We also ordered the zucchini flowers stuffed with gorgonzola, corn on a bed of sauce vierge and soft herbs, and although quite tasty, the dish paled in comparison to the crab and the gorgonzola was a little on the watery side. The sauce vierge was delicious however and I definitely scrapping the plate for a few more spoonfuls. Mauro expertly recommended a glass of the 2017 Pichot Vouvray Sec which was the perfect balance of silky smooth yet crisp and the pairing really brought out different flavours in the other. On to the mains, again sharing, we ordered the Salmon and lamb shoulder. Mauro recommended instead of trying to pair a wine to both the fish and meat, we instead order half glasses and staggered our mains one after the other- Mauro is very smart. The salmon was served with prawn, Israeli couscous, tomato, dill and cucumber and was a huge surprise in flavour. I often expect salmon with a more creamy or lemon-based sauce, where as this tasted more of minestrone soup than anything else. It had a strong initial taste that softens into a blended after taste and it’s a great dish to transition from summer into the cooler months. Mauro paired half a glass each of the 2014 Tinel Blondelet Pouilly Fume which was dry, medium bodied and driven by mineral notes, flavoursome with hints of lemon pie, minerals and just a suggestion of spicy vanilla, in other words, very tasty. Now onto my standout dish of the evening, head chef Luke Mangan’s favourite lamb shoulder cooked with lemongrass & ginger glaze and served with pumpkin and cumin rice. All I can say about this is YUM! The Asian influence on the slow cooked lamb just got better with every bite and at first I thought the rice was a little too much, but after devouring the lamb, I was scooping up the saucy rice for a last opportunity of more. The 2017 Ross Hill Cabernet Franc Merlot had a blackcurrant, blackberry leaf and gentle oak sweetness and was medium bodied and rounded. The flavour of the lamb was enhanced without overpowering them…did I mentioned this dish was delicious? When dining somewhere as delicious as glass, you can’t really ever say no to dessert and upon the staff’s strong recommendation to try the liquorice dish, we both anxiously obliged. Both of us are not fans of liquorice and didn’t know what we were getting into so we added the vanilla cheesecake as a backup. The liquorice dish is in it’s 14th iteration and is celebrating its “25th Anniversary” and I can see why it has stood the test of time. This has to be one of the best dessert I’ve ever had. Period. Served in a white chocolate dome and sprinkled with gold flakes, it was almost too beautiful too eat. Upon cracking open the shell, we were surprised to diced granny smith apple and lime cream ooze out onto the plate. The subtle aniseed flavour mixed with the apple and lime was refreshing yet still indulgent. The cream tasted more mascarpone cheese than what we expected but I am so glad we were persuaded to try it. If you only order one thing at this establishment, make it the Liquorice “25th Anniversary” with apple & lime. Any dish would find it hard to compare to that and although the vanilla cheesecake on a pistachio sponge and served with strawberry, rose, watermelon, raspberry was a light and fragrant dish, compared to the liquorice, it didn’t have much of an afterthought. Mauro served us the Mount Horrocks Cordon Cut Riesling, which was sweet but not overpowering in taste, with aromas of fresh pine/lime, melon and lychee accompanied by floral notes. After having eaten a fair bit of food, I was pleasantly relieved that although very full, I didn’t feel bloated or sickly and I think you only get that feeling after eating fresh, well made food, which is definitely what was served at glass. The venue is intimate and romantic enough for a date night or special celebration but also accommodates large groups quite well, as we saw from a table about about a dozen people celebrating a birthday. Now if anyone can find me my very own Mauro to help me pair my food and wine, that’d be great.